It's Monday here in FL and this means our I ♥ Mondays giveaway is now open! :) Today, you can win one of these fun western Le Top outfits available in sizes 2T-6 (girl) and 2T-4T (boy). All you need to do is comment on the giveaway picture on our Facebook page by copying and pasting ♥ or typing 'love,' 'heart,' etc. The giveaway ends tonight, Monday, at 11:59 pm PST. 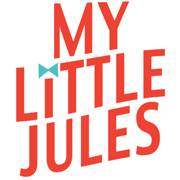 Open to Facebook fans only, so 'Like' our My Little Jules Facebook page to participate. Good luck!